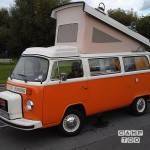 Henry II (so called because of his 2 litre engine) is a VW Type 2 Campervan with a Westfalia conversion, Berlin layout, first registered in 1979. He underwent major restoration work (engine and body) in 2009, and had further engine and body work in early 2014 before being hired out for the first time. Last year he was fitted with a new engine ready for the 2019 season. He lives in South East London (Greenwich area) and is available for hire over a long weekend (Thurs eve – Mon pm), mid-week break (Mon eve -Thurs pm), or for the whole week. Je kan de camper ophalen in bij Andrew. Je kan je auto hier gratis parkeren.